During the rule of the Kushanas, there was a new focus in art: the depiction of personalities. THE early art of India embodies deep philosophic concepts. It takes us on a journey through the development of man’s spiritual thoughts: on a path that seeks the goal of the eternal Truth. Beyond the sculpted gateways and railings, beyond the great entrances of the rock-cut caves, beyond the surrounding walls of the temples lies the most sophisticated presentation of the philosophic truth. Here is that which takes our attention away from the multiplicity of the forms of the world to the concept of the formless eternal. From early times and continuing to this day, in the mountain regions, stupas are often made by placing a few pebbles one on top of another. As divinity is seen in the whole of creation, it is the focus of our attention upon it that creates an object of worship. All that there is, is a manifestation of the formless eternal, and we may see that Truth in any object that we choose to. The Buddha, Kushana period, 2nd century A.D., Katra mound, Mathura region (Government Museum, Mathura). The quality of prana, or inner breath, is evident in the figure. The quality of animation and life marks this figure as a masterpiece of Kushana period art. It was donated by Amoha-Asi, a nun, "for the welfare and happiness of all sentient beings". This is a common wish expressed in donative inscriptions at Naga, Jaina and Buddhist sites of this period. The followers of the Buddha enshrined his mortal remains in a number of stupas. Thus began a tradition that spread to many countries. Later stupas housed the remains of other great teachers, their personal belongings and also Buddhist teachings. Numerous stupas were made in the Buddhist and Jaina traditions in India for many centuries. Similarly, there is the marvellous philosophic concept embodied in the Siva Linga. The Linga is the “mark” (with a secondary meaning as a phallic representation) of the formless eternal taking on the forms of the world. A great and complex thought process is marvellously encapsulated in one of the greatest symbols of the world. For instance, the great Siva Linga of Tamil Nadu, the Aakasha Lingam of the Chidambaram temple. There is a curtain in front of it representing the veils of our illusions. When we move this aside, there is nothing to be seen beyond: that is the greatest Siva Linga. Tradition is still alive in the temple which holds that this is the finest representation of the Upanishadic Truth. In early Indian shrines from the 2nd century B.C. onwards, the focus was on meditation. The aim was release from the cycle of the pain of life. The eternal themes were represented in art, and personalities were not shown. Generalised depictions of men and women were seen along with the natural world. Yakshas and Yakshis embodying the creative force of nature were a favourite subject. The first formalised deity, seen from the 2nd century B.C. onwards, was Lakshmi being lustrated by elephants. In the meantime, the Buddha, or the Enlightened One, was alluded to by symbols of his achievement and of his presence. The Buddha, Kushana period, 2nd century A.D., Peshawar Valley, Pakistan (National Museum, New Delhi). The Gandhara art of the Peshawar Valley is known for some of the finest sculptures made in dark grey schist. This statue is typically Gandharan in style with its long, flowing drapery with heavy schematic folds. Forms of the world were presented on railings and gateways as well as on the exteriors of rock-cut caves. With the passage of time, forms of the life of the world were also brought into the interior of the hall of meditation. However, in the heart of the shrine, there were no forms. The gentleness of the figures one passed on the way to the shrine prepared one, until finally one could meditate upon that which was formless and beyond the world of forms, beyond desire and pain. In the north, Mathura was strategically placed at the entrance to the plains of the river Ganga. Thus, it was a major junction for trade. It was also a great centre of culture and art. Under the Kushanas, who ruled from the 1st to the 3rd century A.D., Mathura became the winter capital of the empire. Gandharan representation of the Mahaparinirvana, Kushana period, Gandhara region ( Indian Museum, Kolkata). Whereas earlier art had focussed on the purely spiritual and philosophic aspects of the message, attention in Gandhara was more on the life of the Buddha as a heroic individual. Gandharan representations are full of the drama of his life story, as in this depiction of the pathos of the moment of his passing away. Only the monk Subhadra is seen peaceful as he is aware of the transitory nature of all life. The Kushanas, or the Yeuh-Chih, were tribes who came from southern China. They patronised Buddhism and the Brahmanas, as Indian kings had done before them. However, theirs was a different vision. The subject of art in India was eternal themes, not transient personalities. Trees and flowers, birds and animals, mythical creatures, common people, creatures that combined these different beings, all these were preented in art. So were Yakshas and Yakshis, who personified the spirit and abundance of nature. Emperor Kanishka, Kushana period, 1st century A.D. (Government Museum, Mathura). The Kushanas, who hailed from southern China, were the first Indian kings to have portraits of themselves made in their shrines. However, this tradition did not last for long in India, where Upanishadic ideas prevailed. In this vision, there were no portraits of kings even though they were benevolent to all streams of religious thought. Jaina tirthankaras and Buddhas were also not depicted. They were alluded to through symbols. The Kushanas brought a different outlook with them. The coins made by the Kushanas were the first in India to have portraits of kings on them. Near Mathura, as well as at their other capital at Peshawar, they built royal shrines with images of themselves. There is a statue of Vima Kadphises, described as “King of kings, Son of God”, made out of the typical red sandstone of the Mathura school. Another portrait statue has a similar inscription, this time bestowing royal and divine titles upon Emperor Kanishka. He is dressed as a Scythian, with padded boots and heavy clothes. The clothing is not in the Indian style, where it reveals the body shape. The cult of the worship of kings did not last beyond the rule of the Kushanas. However, in this period there was a new focus: the depiction of personalities in art. Images of Buddhas and Bodhisattvas, Jaina tirthankaras, Siva, Vishnu, Kartikeya and other Hindu deities were created. These followed the earlier models of the Yakshas and N agas. Queen Maaa's dream (Indian Museum, Kolkata). In the Gandhara region, with Greek and other influences, the focus of art changed in the Kushana period. Events in the Buddha's life and depictions of him became the main subject of art. Kushana coins present some of the earliest images of the Buddha. A Kushana coin also carries a very early image of Siva, with his characteristic trident and with Nandi, the bull who accompanies him. 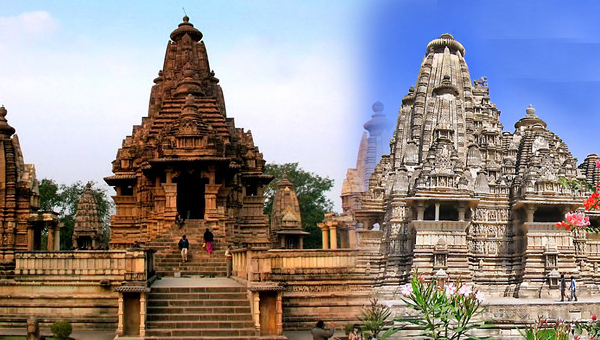 From the 2nd century B.C., there were two Jaina stupas at Kankali Tila, near Mathura. Sculpted remains have been found, which show the close similarity between the art and symbols of the Buddhist and Jaina faiths. The region also had flourishing temples dedicated to Naga deities. An imposing image, over eight feet (2.44 metres) tall and inscribed as a Bodhisattva, was installed at Sravasti around A.D. 100. It was donated by a bhikshu, or monk, named Bala. The standing Bodhisattvas, or Buddhas, carry forward the formal frontality of earlier Yaksha figures, which emphasises their monumentality. The body displays the softness of human flesh, unlike muscular and athletic depictions. A cloth goes across the left shoulder and hangs over the arm in very fine pleats. 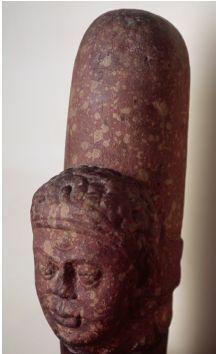 Ek Mukhi Siva Linga, Kushana period (Government Museum, Lucknow). The Siva Linga is one of the most profound symbols of humankind. It is the "mark" of the unmanifest eternal manifesting itself in innumerable forms of the world. Simultaneously, it embodies the vital forces of nature in the manifest world. The form in which the Buddha was presented was that of an enlightened being, one out of many, with 32 attributes that identified him as such. The long arms and elongated ear lobes; the urna, a mark on the forehead; and the ushnisha on the top of the head are some of the auspicious marks. A number of images of seated Buddhas and Bodhisattvas have been found, including a fine one from the Katra mound. This was donated by Amoha-Asi, a nun, “for the welfare and happiness of all sentient beings”. This is a common wish expressed in donative inscriptions at Naga, Jaina and Buddhist sites of this period. The quality of prana, or inner breath, is evident in the figure. There is a quality of animation and life that marks this figure as a masterpiece of the Kushana period art. Behind his head is a large halo with scalloped edges, representing the emanation of light. An image of Surya, who represents the sun, was found at Kankali Tila. 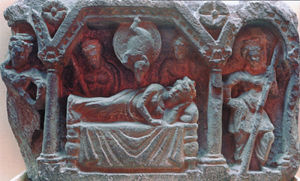 The image was also made in the 2nd century B.C., in a vihara at Bhaja in western India. The boots, jacket and moustache indicate Iranian influences. An architectural fragment from Mathura shows an image of a Siva Linga being worshipped. Several lingas of this period, with one face or with four faces, have been found. Kartikeya is also depicted, carrying a spear. He was later incorporated into the Hindu pantheon as the son of Siva. 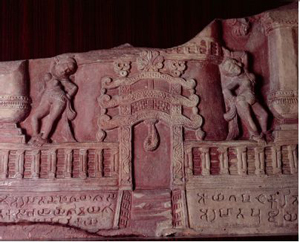 Vrikshadevi, Kushana period, a curved architectural fragment of a stupa railing, Sonkh (Government Museum, Mathura). 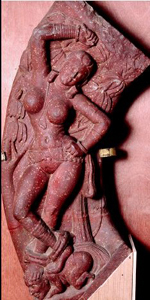 Yakshas and Yakshis abound in the art of Buddhist, Jaina and Brahmanical monuments. They embody the fertility and bounteous vigour of nature. While images of deities were coming into being in the art of Mathura, the main focus remained on stupas, both Buddhist and Jaina. As in previous times, the railings and gateways of these stupas presented the boundless fruitfulness of nature and the joy of life. Like the Buddhist monuments, the Jaina stupa that once stood at Kankali Tila presents us with the ultimate goal of every being. As one approaches it, one is greeted by images of the creative forces. On the railings of the stupa, the Yakshis and the trees that they stand against or grasp represent nature. It must be remembered that in Indian thought all beings, human, animal and plant, are intrinsically the same. This kinship of life is perfectly expressed in these images, where the touch of a maiden brings trees to blossom. 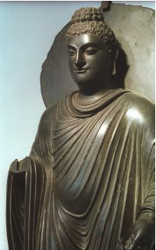 Buddhism reached Peshawar, in the Gandhara region, in the 3rd century B.C. through the emissaries sent by Emperor Asoka. This region was a meeting point of the cultures that travelled on the trade routes from China to the Mediterranean. Concepts of Indian philosophy, which placed emphasis on the renunciation of worldly desires, were new to many here. Kanishka held the Fourth Great Buddhist Council in Kashmir. This was the first time that Mahayana Buddhism was given the full support of royal patronage. The council was also significant for making Sanskrit the main vehicle for Buddhist scriptures. The Mahayana school of thought, which was far less austere than the earlier Buddhism, soon gained popularity in the Gandhara region as well as in Central Asia and China. Little remains of the numerous Buddhist monuments that were made in Kushana times in the Gandhara region. However, vast numbers of the sculptures of this period have survived. The stone these were made from is the local grey schist. The sculptures of this region show influences of Mediterranean and Persian styles. Instead of the spiritual, idealised forms of Indic mainstream tradition, these sculptures attempt to present the appearance of people in the world and their everyday expressions. The drapery shows the influence of Western models. Whereas in the Mathura school the figures are presented in transparent, light clothing, here the garments are made with heavy folds and great emphasis is given to their plasticity. The body is more muscular, in keeping with Greek and Roman norms. Worshippers bearing garlands at a stupa, from the coping stone of a stupa railing, 1st century B.C., Sarnath (ASI Museum, Sarnath). From the earliest times in the Indian subcontinent, stupas were worshipped in the Buddhist, Jaina and other faiths. In early Buddhism, the focus was within oneself, on the potential for enlightenment, which is in each of us. In the Gandhara region, the attention began to go more towards a heroic personality of the Buddha and other Buddhas as distinct individuals. These could be prayed to for their help. A number of Buddhas, as mentioned in scriptures, including Gautama and Dipankara Buddha, are depicted in Gandhara art. The Jatakas, or stories of the previous lives of the Buddha in the form of different men and animals, were the subject of the earlier art. These were based upon the Indic philosophic view, which saw the unity of all of creation and the cycle of births in the world of forms. The population of the Gandhara region was not deeply versed in this philosophy and would have found it simpler to relate to the life of the individual Gautama Buddha. The worship of the stupa continued in Gandhara. However, the stupa was considerably smaller and was surrounded by rows of image shrines. These contained images of Buddhas and Bodhisattvas, and their large numbers indicate the shift in the emphasis of worship. Unlike Gautama Buddha, who is beyond worldly adornments, Bodhisattvas were adorned with jewellery. Beyond the world of forms, the stupa had earlier been kept plain. Now, narrative panels relating the life of the Buddha were placed on it, at the base. The Four Great Events in the Buddha’s life were presented most often. Other incidents and legends from his life were also introduced. Here, the emphasis became more on the drama of life in the ephemeral world. Human life, personified in the Buddha, before and after enlightenment, became the vehicle of the message. 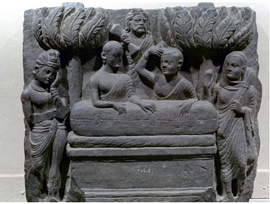 Depictions in the Gandhara region significantly dramatised the events of the Buddha’s life and presented them with charged emotions. The first of the Four Great Events to be presented in the narrative sequences that were created was the birth of the Buddha. Here, Queen Maya is made in the continuing tradition of Yakshis, who stand beneath trees. The name Maya means “the illusory nature” of the world of forms and is there as a constant reminder for us. At the event of his enlightenment, the Buddha is depicted as meditating under a pipal tree. Mara, which means “to kill”, represents the turbulence of desires within us. Mara and his army are shown attacking the Buddha with a variety of weapons. The Buddha remains serene. The first sermon is depicted with deer to indicate the location at the deer park at Sarnath. The final Great Event is the Parinirvana of the Buddha, when he leaves behind the pains and shackles of his earthly body. The expressions of grief of his followers are dramatic. Only one, the monk Subhadra, is peaceful as he is aware of the transitory nature of all life. 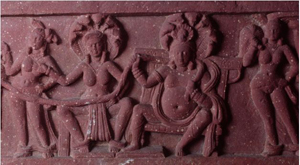 Naga Deities, Kushana period, horizontal beam (Government Museum, Mathura). Nagas are among the earliest deities to be depicted. They are seen in the art of all religious faiths. 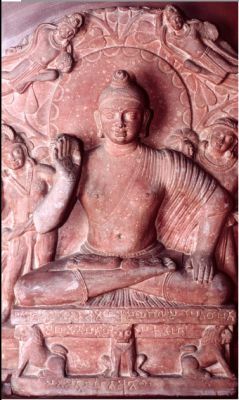 One of the most dramatic contributions of the Gandhara region to Buddhist art is the depiction of Siddhartha during his period of extreme asceticism. This depiction shows the Buddha severely emaciated, with bones and veins sticking out. It is an exaggerated presentation of dramatic proportions. 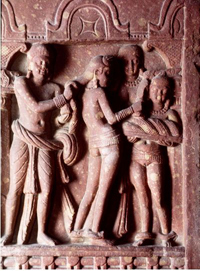 The narrative depictions and figures in the art of Gandhara were formulated by the end of the 1st century A.D. The sculpture flourished at its best in the 2nd and 3rd centuries. The production of the Buddhist art of Gandhara came to an abrupt end in the 5th century with the invasion of the Huns. In the meantime, the tradition of art in the northern plains of India continued to evolve. Mathura continued as a vital centre of art. The sculptures made there have been found far and wide. This is noteworthy, as in this period, it was the sculptors who were usually known to travel and not the artworks, which were made in heavy stone. These were obviously used as models for the art of other regions. Vishnu, Kushana period (Government Museum, Mathura). In this period, forms were created of the many deities of the Indic traditions. These became pan-Indian representations of philosophic ideas and concepts that continue to present times. The portrayal of deities had become central to Indian art. These deities were the personifications of qualities. By meditating upon them, one can awaken the best that is within one. This concept of deities travelled from India to other countries of Asia. It took deep root everywhere, and to this day the puja, or the adoration of deities, continues in these lands. These graceful representations move and transport us far from worldly concerns to a peaceful realm within. They are a path to take us eventually to a realisation of the formless eternal.